Professor John Maynard Smith, the internationally renowned evolutionary biologist, 84, died peacefully at home on April 19. Maynard Smith was remarkable for the breadth of his contributions to biology, including his radical application of game theory to understanding evolutionary strategies, and his clear definition of the major transitions in the history of life. Maynard Smith was always enthusiastic about new data sources and continued to be a driving force in the use of molecular data to answer biological questions. Like his mentor, J.B.S. Haldane (one of the founders of the modern synthesis of Darwinian evolution and genetics), Maynard Smith was deeply committed to making evolutionary ideas accessible to a wide audience. His book, The Theory of Evolution, inspired many of today's leading researchers to become biologists. Despite his fame, he would nevertheless take time to discuss ideas with undergraduate students and eminent professors alike. Maynard Smith was Emeritus Professor of Biology at the School of Life Sciences, University of Sussex. He joined the University as the founding Dean of its School of Biological Sciences in 1965, and served as professor there until 1985. He remained active in original research until his death, working on the evolution of animal behaviour, and practical issues such as tuberculosis in cattle. A graduate of University College London, where he first taught before coming to Sussex, Maynard Smith's distinguished career spanned more than 50 years and brought numerous accolades and honours, including the Crafoord Prize in 1999, awarded by the Swedish Academy of Sciences and widely recognised as the equivalent of the Nobel Prize. Japan followed suit with the Kyoto Prize, Japan's highest private award for lifetime achievement, in 2001.The citation read: "Professor Maynard Smith is a keenly intelligent and curious biologist, yet he is capable of explaining complex theory in simple terms and with wit and a sense of humour." The University of Sussex also acknowledged his achievements, awarding Maynard Smith an honorary degree in 1988 and renaming its Biological Sciences building after him in 2003. Colleagues and friends paid tribute today to Maynard Smith's unique contribution to biological science and to the University. 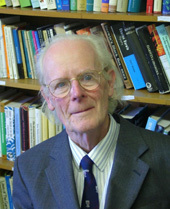 Professor Alasdair Smith, University of Sussex Vice-Chancellor, said: "John Maynard Smith was one of the great scientists of the 20th century. He was the central figure in the development of biological sciences at Sussex. The University mourns his passing." Maynard Smith's colleagues at the Centre for the Study of Evolution are feeling the loss of a dear friend and energetic colleague, whose knowledge, enthusiasm and curiosity enlivened discussion, whether in the office, in the field, or in the pub. A celebration of the life of John Maynard Smith will be held at the University in the near future. All enquiries please, to University of Sussex Press Officers Jacqui Bealing or Maggie Clune,Tel. 01273 678888, Fax 01273 877456, J.A.Bealing@sussex.ac.uk or M.T.Clune@sussex.ac.uk.